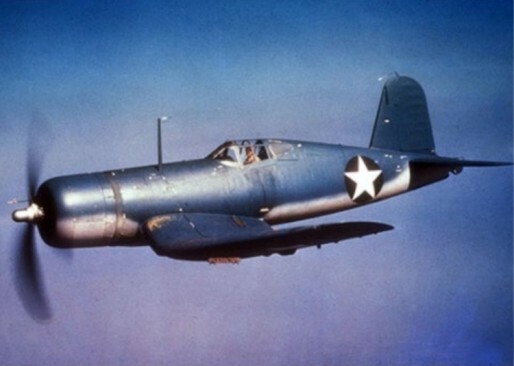 The birdcage Vought Corsair – The famous bent winged bird | The M.o.B. The American Navy Bureau of Aeronautics in February 1938 realizing that there was the impending likelihood of the outbreak of a major war issued a request for a proposal of a carrier capable fighter aircraft. Although other fighter aircraft were at that time under development [Grumman Wildcat etc.] it was felt that these were inferior or at best only equal to land based fighters. The impending threat of war was the catalyst for the request for a new design of a fighter aircraft for the Navy. Notwithstanding the disadvantages of carrier landing speeds and durability requirements, this aircraft was to have a superior performance capability to existing land based fighter aircraft. Three companies submitted designs and the one deemed the most promising was that of Rex Beisel`s team at Vought. The machine was designed around the 18 cylinder 2,000 HP Pratt & Whitney Double Wasp radial air-cooled engine [a big risk as it was still under development.] A monster 4 metre prop was needed to fully harness the massive power produced by this engine. To accommodate such a large diameter prop, a novel approach was adopted by the design team which also went a long way to reducing any weakness in the undercarriage of the machine. Of course this was the so called gull wing, it`s shape reduced air resistance by virtue of the fact that the wing was attached to the fuselage at the optimum angle. One prototype was ordered and first flew in May 1940; during a later flight in October it became the first American fighter to achieve a ground speed of 405mph. Combat reports coming from Europe led to the Navy requesting upgrades to both the armament and defence of the aircraft. Vulnerable fuel tanks in the wings were replaced by a tank in the front fuselage, requiring the pilot`s seat to be moved further aft and a battery of 3 x 12.7mm machine guns in each wing joint. June 1941 saw Vought awarded a production contract. The heavy framing of the early Corsairs cockpit led to it being christened the birdcage. Yeah guys I know it`s not a ship, but it flew from ships O.K.? This a massive undertaking by any measure, wingspan 390mm, fuselage length 318mm. 17 sprues of plastic parts, 2 sheets of etched metal, 2 tyres, 2 decal sheets, 1 masking sheet for clear parts and a bag containing a couple of metal rods and tools. Also one has a choice of whether one extends the wings or folds them, a choice of a seated or standing pilot and the appropriate seat belts for same. One can even have the gear down or up with the aircraft mounted on a stand. I am too old for all these decisions; I should have stuck to a ship. S**t does everyone have to agree with that? O.K I will learn from your silent agreement. The book of words even said I can build three aircraft, but I can only find parts for one model in the box. I don`t recall the book of words for a model boat making such an inane statement like that. Anyway with folded wings it takes up a lot less room so I went with that one. Getting started, over steps 1 to 12 we build up the office and I must say that it comes up a treat, although one has to be careful over detail painting of the consoles. I elected to leave the pilot out as that gives a better view of all the detail. Please can one of you guys invent a small tipped paint brush with a built-in magnifying thingy I`ll buy all the first production. As I find it rather hard to paint a microscopic pin head sized part in seven different colours. Therefore some of the office bits are a little inaccurately painted. Holy crap it comes with metal seat belts!! Jesus I am glad I never got to fly this thing. Do you know what a metal seat belt could do to your cojones? It hurts when you heave on an ordinary leather/fabric belt to get it tight enough. My eyes are watering at the thought. Steps 13 to 19 cover the building of the main fuselage and there is really a lot of fine detail and a lot of small parts that require a fair amount of detail painting. 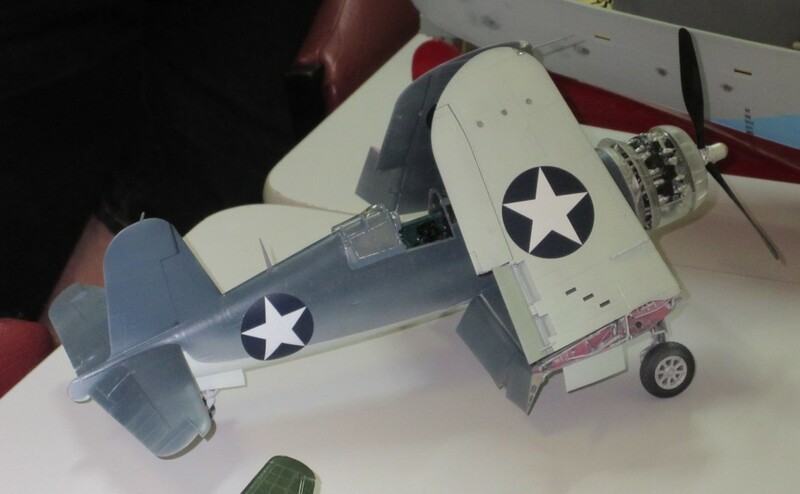 Having seen some aircraft of this vintage up close the finished models detail is superb. It is very sad as most of this detail will be hidden inside out of sight. The next three steps cover the forward firewall and exhaust pipe construction and fitting of some exterior panels etc. Being bored or overwhelmed by all these small detail bits I cheated half way through and started on the Pratt & Whitney R2800-8 just because I could. Stupid mistake! It was even more finicky and demanding, or well one can only live with stupidity. Over eight steps I built the bloody thing, I don`t know what I did wrong but I can’t get it to start, maybe I set it up on the induction stroke and not the ignition stroke or I got the firing order wrong. I said fire in eleven different languages but it wouldn`t even try to fire. Hey maybe I used the wrong ignition module, it came with two. Hey but it looks neat. The wings are the next job and the undercarriage is included in this sequence as well. 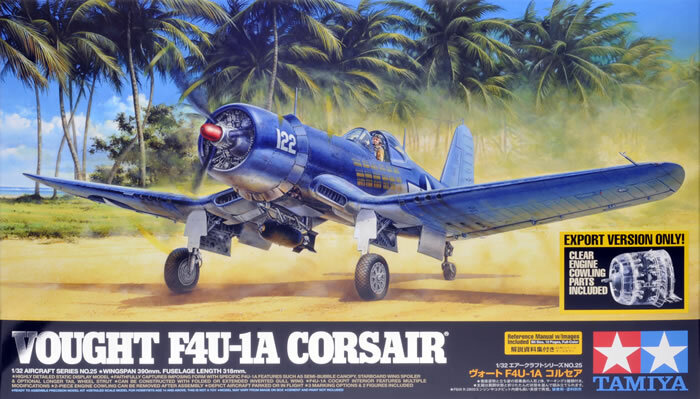 As the Corsair had its oil coolers in the wing roots these the first job in this sequence and the finished product is very impressive. These are mounted in the wing root under surface along with the central main spar. On to this spar, the two outer wig spars are attached. We next add several highly detailed ribs and wheel bay panels. The upper wing root surfaces are then added. This gives a fantastically detailed unit which is the best that I have personally seen on a model. After the wing fold mechanism is added we can then go on to the flaps and outer wing sections after attaching the unit to the bottom of the already built fuse. The very highly detailed U/C is made up of approx. 17 pieces per unit plus about 8 bits for each unit`s doors. Lastly the flaps have to be made in either the up or down position. I chose the latter. Now the canopy is painted and attached to the model, which I chose to display open. Finally I look like getting to the end as now we are on the outer wing units. These are the recipients of quite a lot of small details around the wing fold. The tips are added along with the flaps and ailerons. These units one slips onto the folded main spar and permanently attaches with a couple of small fittings. I chose not to go this way and left them so I can attach or not as I wish. It took a lot of careful sanding to get a good fit of these outer wing units into the slots in the central wing section so as I can fit or leave off as I wish. As I had cheated and already built the prop I now fitted same. Electing to use the clear engine cowl so as to display the engine the machine was finished and only required painting and the decals applied. Plus several small parts added. The only complaint that I have is that no one told me it would be so hard. Yeah Zim I know that I would not have understood that word. I am very, very happy with the outcome. I wish that I had had the chance to fly one. [Without the metal seat harness of course.] Does it count if I get an R/C model?